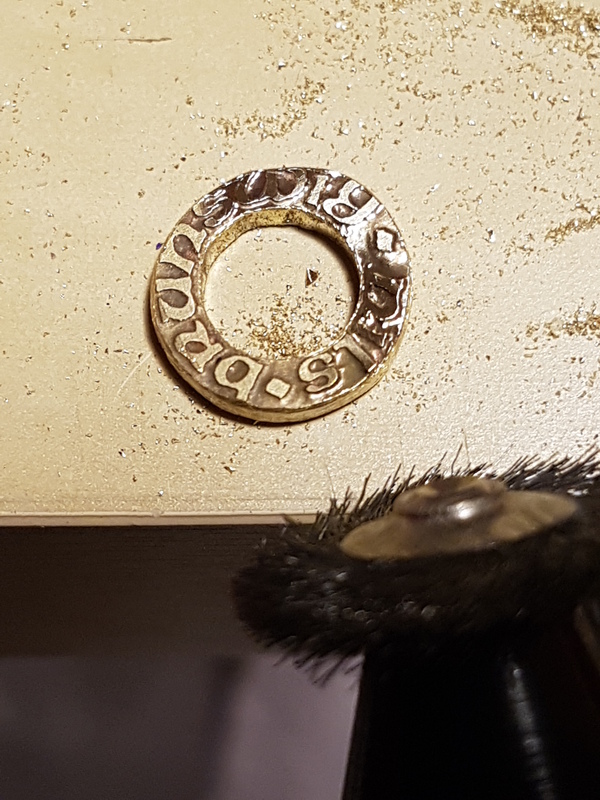 For some upcoming maille projects I wanted to make myself a signature ring. The details you can find here on this page but also you can find an overview in the linked video. The signature rings are planned to be used in a 4in1 weave of 9mm inner diameter riveted aluminium rings. 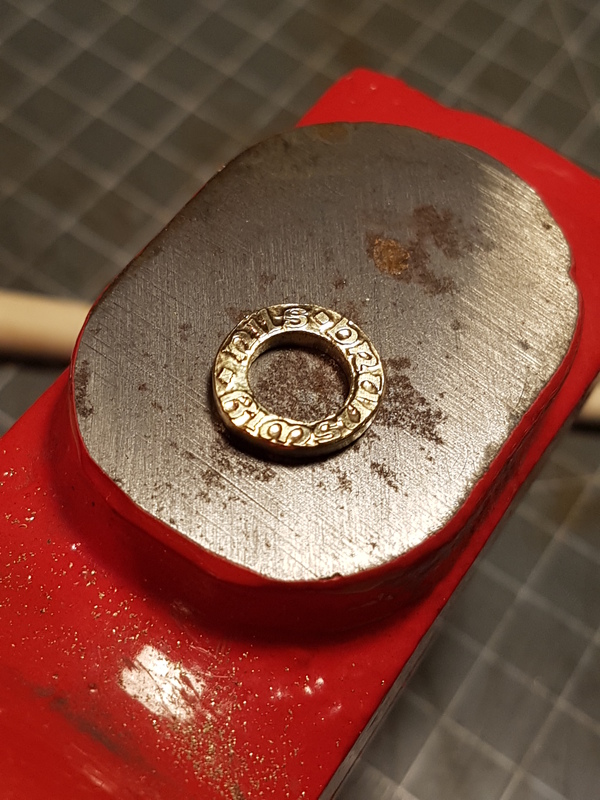 So I choose to make the signature ring with a 13mm outer and a 8mm inner diameter by 2mm thickness. 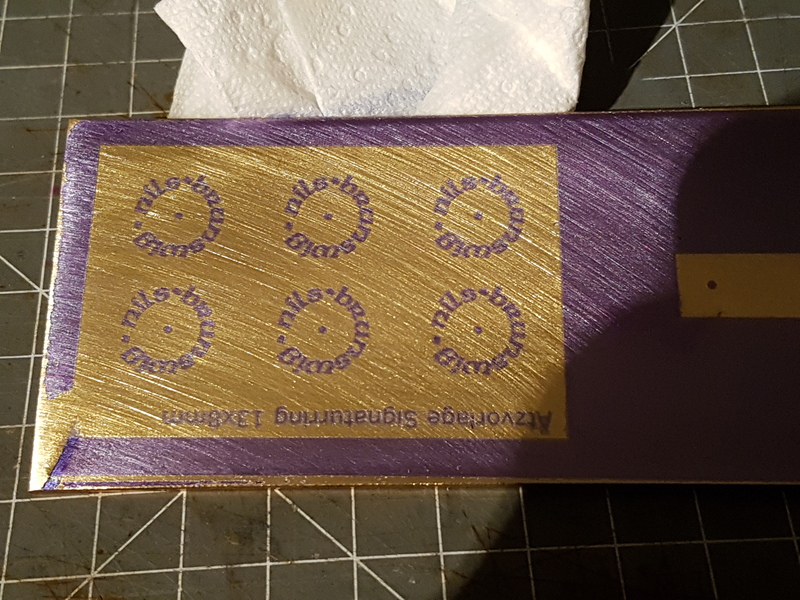 As material I will use brass and I will try to electro-etch them by protecting the brass with a photoresist and etch it in a saltsolution. First step for the photo-resist is to make a template on a semi-transparent paper. I draw the template in inkscape as an .svg. 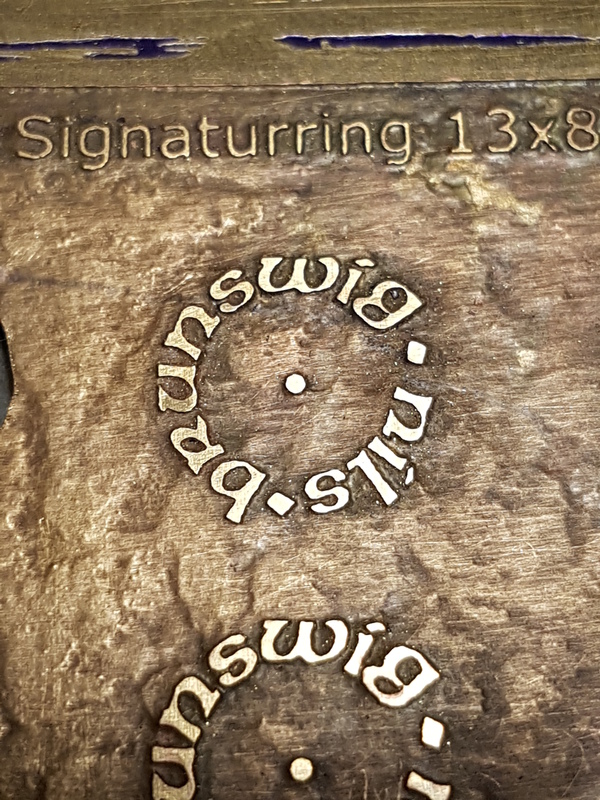 The inscraping on the rings will be my name and the medieval name of the town i´m working in. 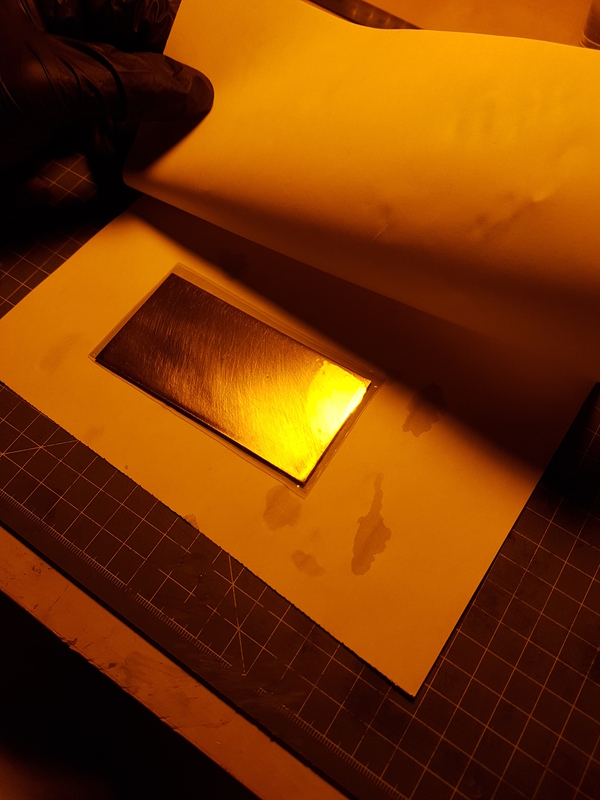 In the illumination of the photo resist the printed side of the paper will lay directly on the brass to avoid shadowing. This means that all letters are written on mirror-inverted. 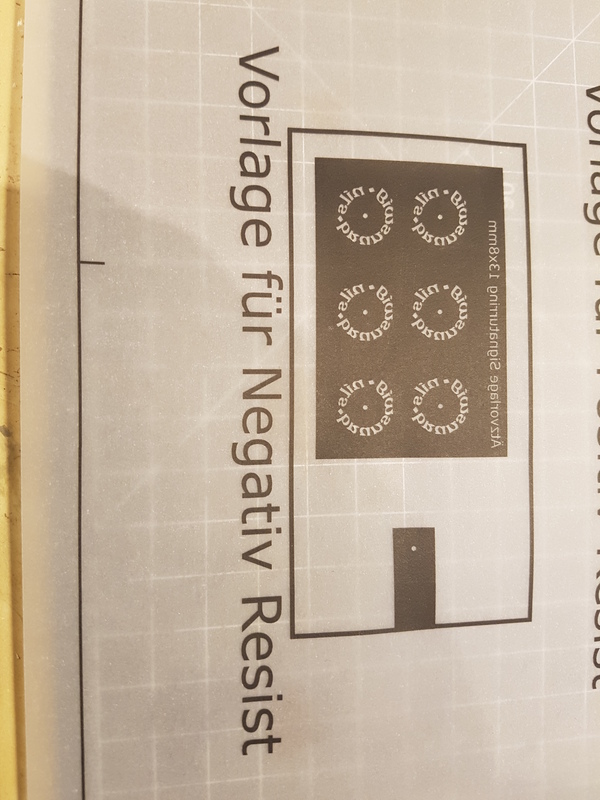 I will use a photo-negativ resist. 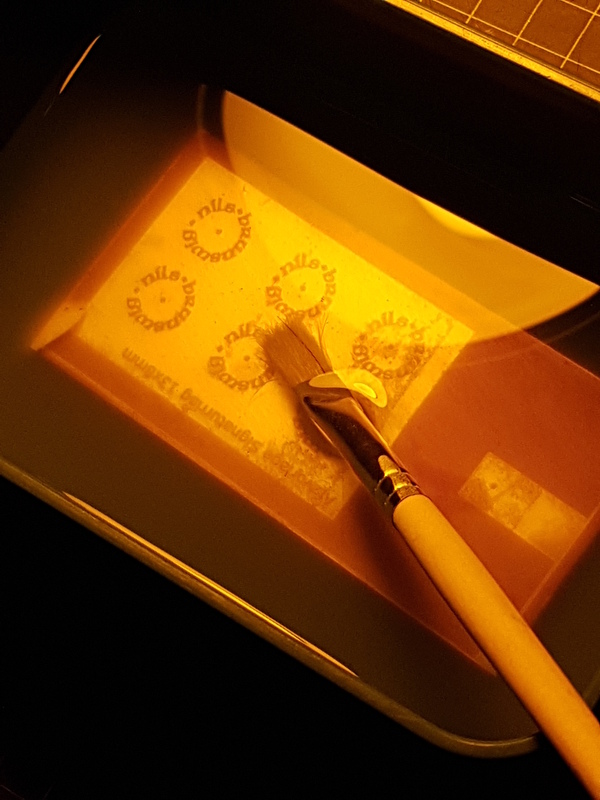 So the illuminated areas on the photoresist will remain and will protect the workpiece while etching. The used paper is a semi-transparent one and I used an inkjet printer. 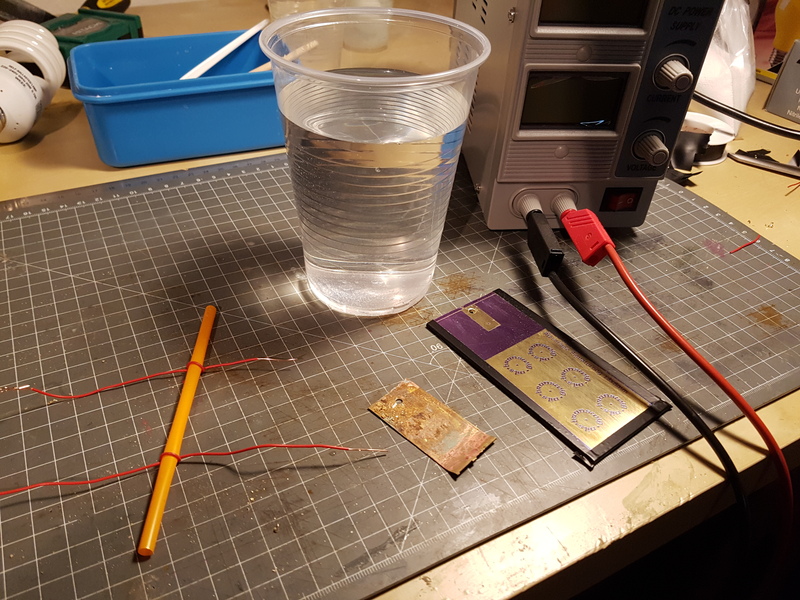 Next step is to illuminate the photoresist. I already prepared the brassplate by polishing it with 240 grid and dregreasing it. 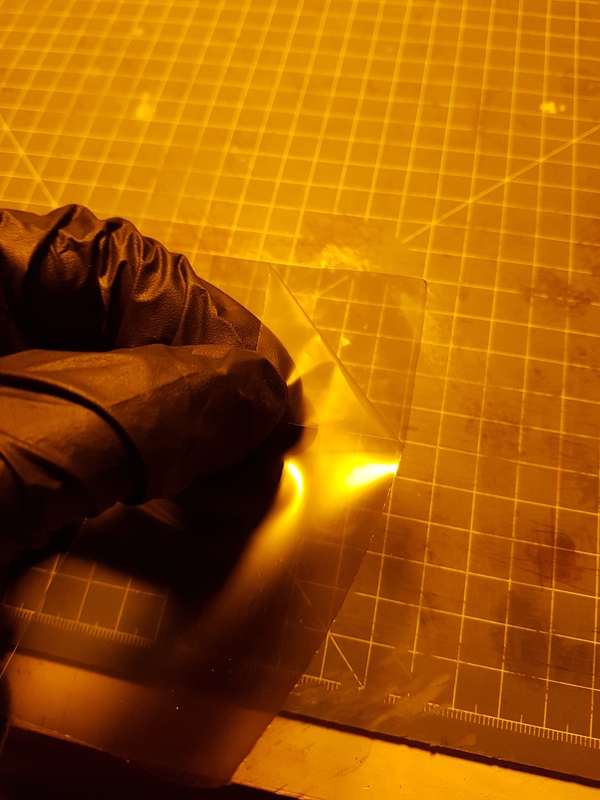 The photoresist reacts to UV light so it must be protected while handling it. 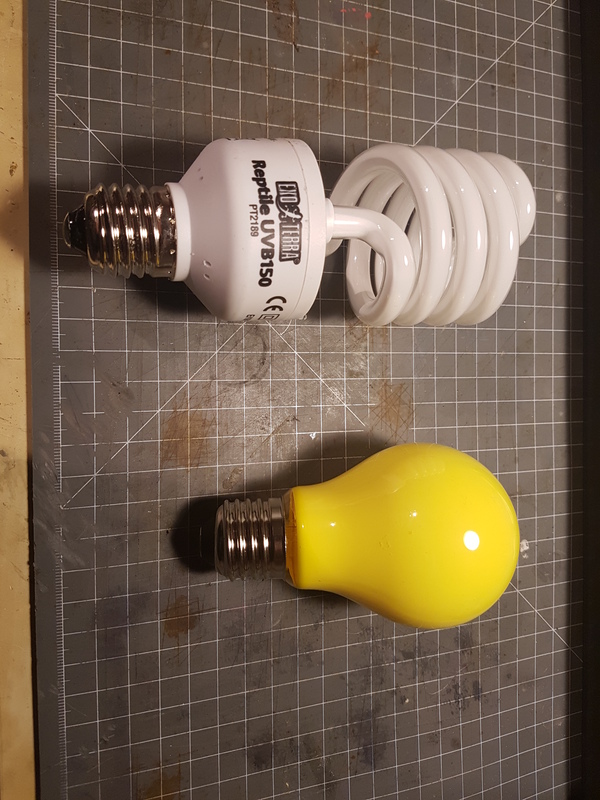 While handling it I work under yellow light and later the illumination I do with an UV light used for terraria. 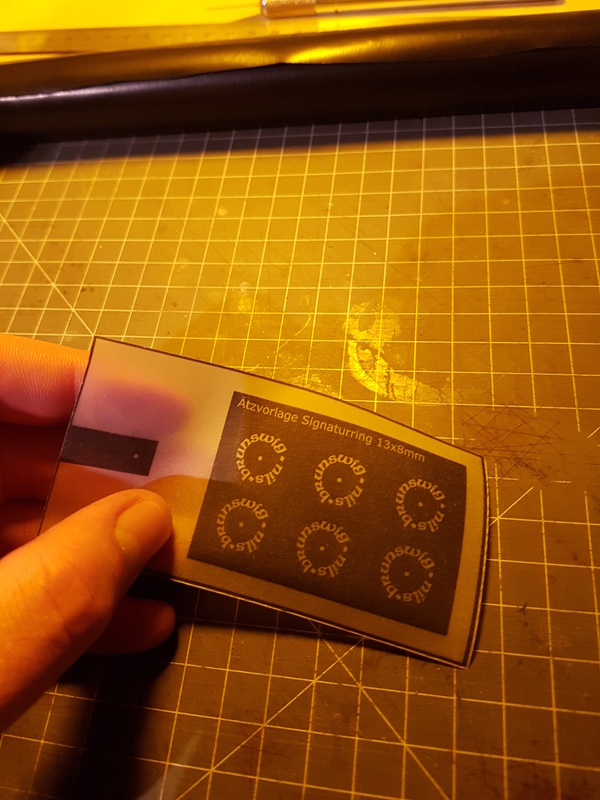 After cutting the photoresist to size (I use a film but you also get photoresist as a paint or spraypaint)…. ….I peal of the protective film from one side of the resist. Then the photoresist is wetend (purified water), applied to the brassplate and all remaining bubbles and water is pressed out from the middle outwards with a cloth rapped around the finger. 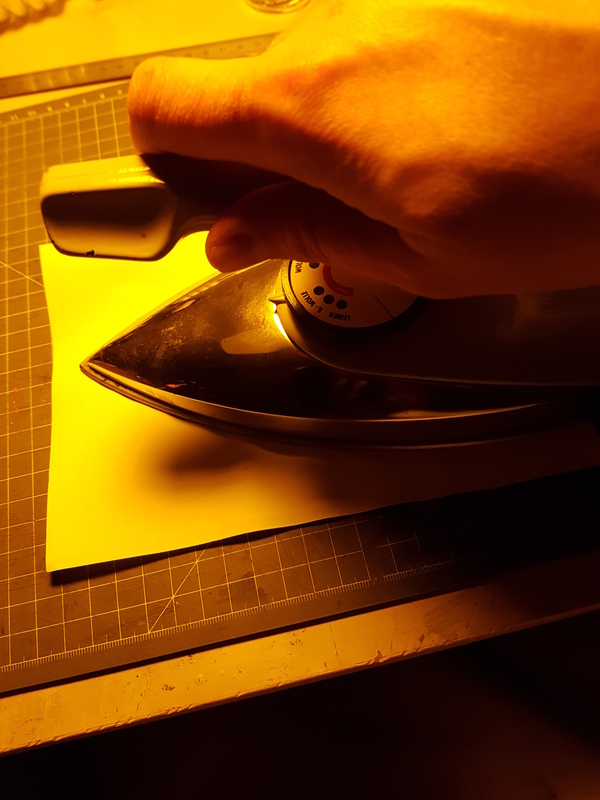 To strengthen the bound I put the brassplate with the attached resist between papers and iron it on lowest heat. For the illumination the template is cut out and pressed on the brassplate between a pictureframe. The template is then iluminated with the UV light for 20 minutes. 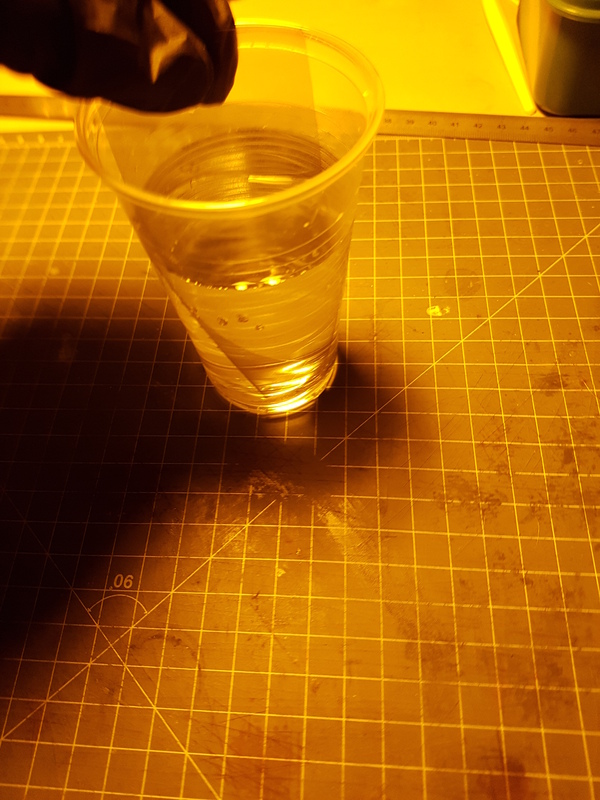 After the ilumination the difference in the photoresist is already visible. 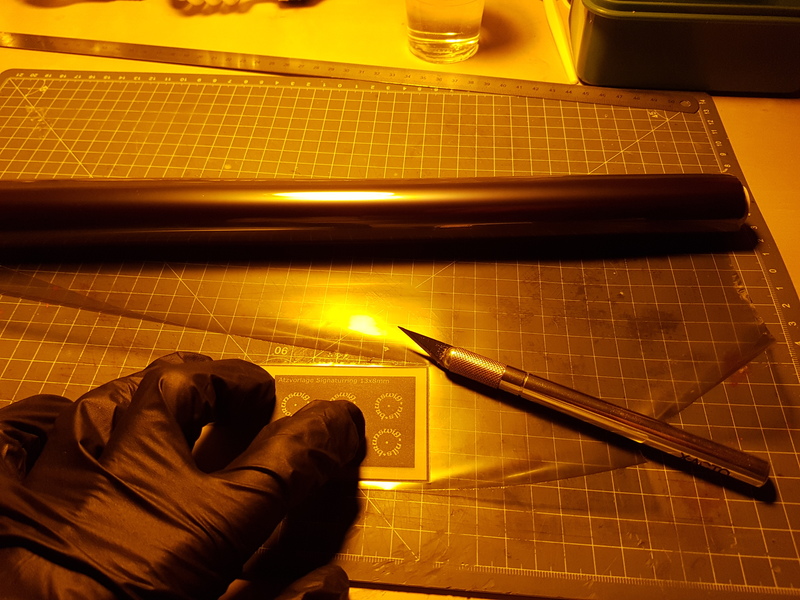 The second layor of protective film is peeled of and the plate is put into a developer. According manuel the process should take about 5 minutes but I needed about 15 Minutes till all not iluminated resistance was dissolved. Now the plate is nearly ready for etching. 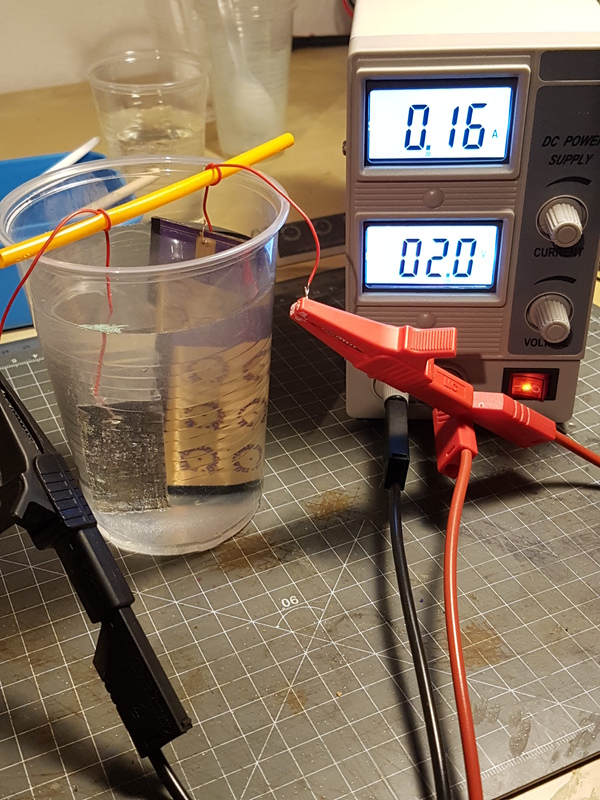 for the electro etching I will use an power adapter with a max power of 12V. The etch runs by round about 0,2 A to get a smooth etch ground. 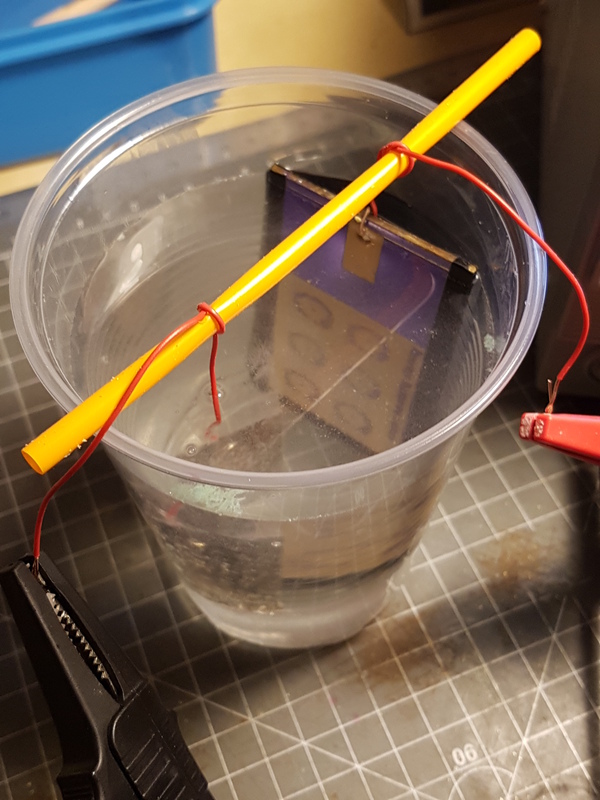 In addition I need a container for the saltwater, a holder for the electrodes (drinking straw with rapped around cables) and a sacrifical piece of brass. The saltwater consist of water with enough salt that no more salt will dissolve. 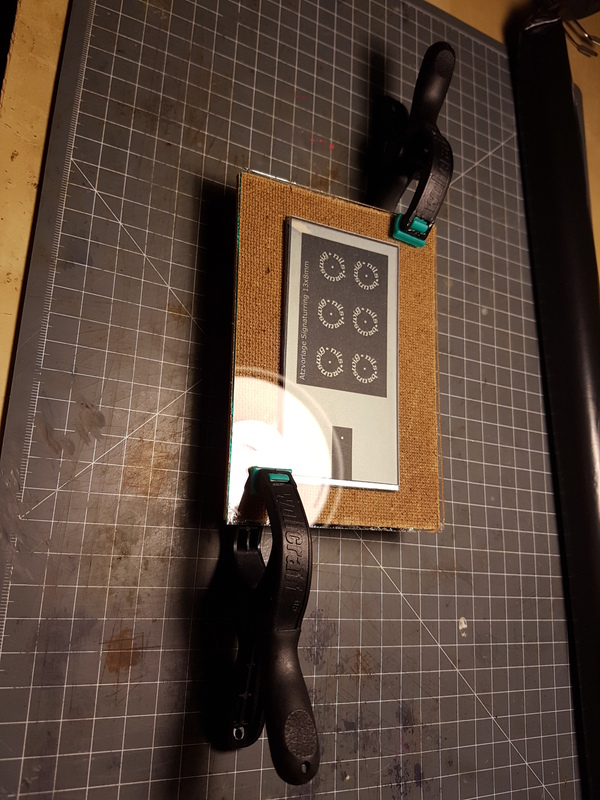 The etch piece and the sacrifical brass are put on the electrodes while the power supply is switched off. The piece to be etched must be put on the positiv side. To start the voltage is adjusted till the Amperes reach 0,2A. The water round the sacrical brass should start to bubble (attention this is hydrogen and can reach to an explosive mixture when not done by good ventilation). While etching I had to clean the etch piece from time to time cause the currency dropped due to a layer of dirt. 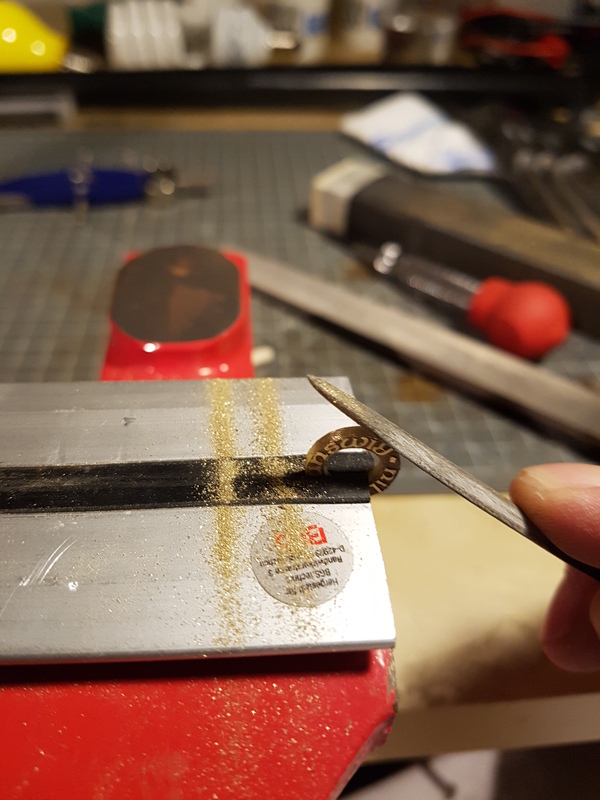 The plan is to saw out the rings with a goldsmith saw. First I centerpunch and mark the inner and outer diameter of the rings with a compass. Then I drill in 2mm holes, one in the inside and one on the outside of the rings. Then I cut out the rings I need. 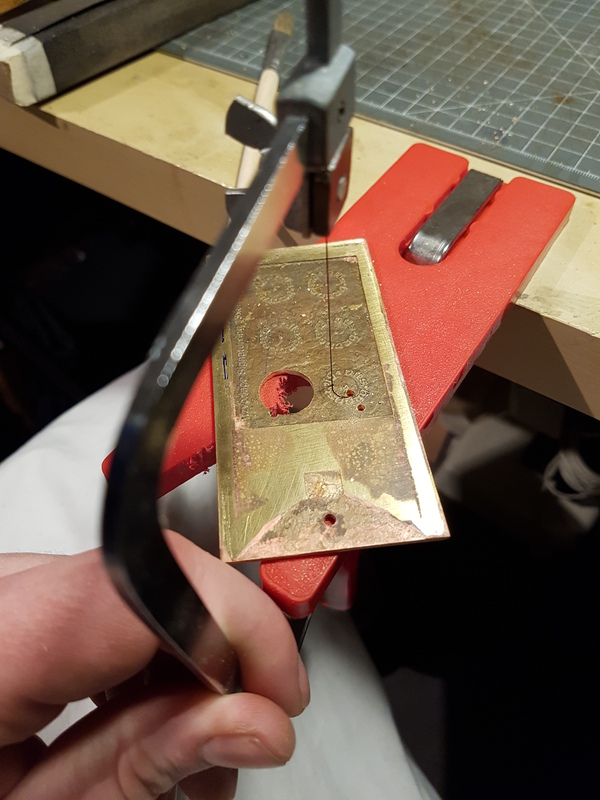 The cut out rings need just a quick path with a key file. 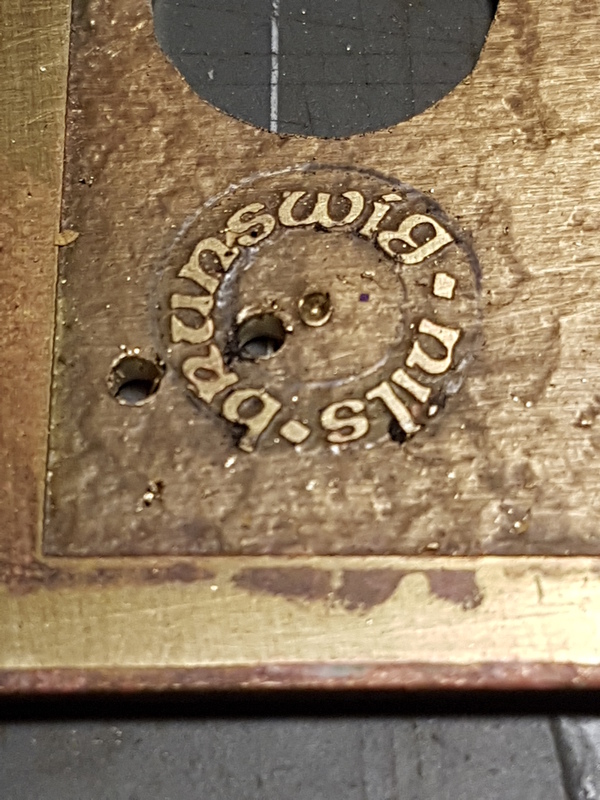 I polish the rings with a stainless wirebrush on a dremeltool. Danke für die Blumen. Will die Technik noch weiter ausprobieren. This entry was posted on August 23, 2018 by nilsmandel in Historisches.